In this economy, it seems unthinkable that people would pay up to six figures just to find a mate. And yet expensive matchmakers are reporting that business is up these days. 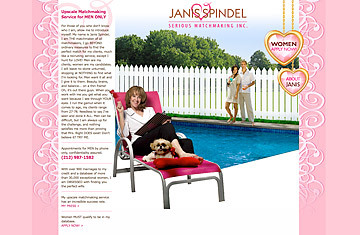 In New York City, Janis Spindel, who charges clients between $50,000 and $500,000 a year to find the "woman of their dreams," says membership jumped 41% in 2009 from the year before and is up 46% so far this year. Premier Match, a New York Citybased agency where annual membership costs a minimum of $5,500, logged $1.5 million in sales last year, a 30% increase from the previous year. Founder Christie Nightingale says her business "hasn't faced the recession." So who is willing to pay this kind of money? James, 48, a private-wealth managing director at an investment bank who asked that his last name not be printed, was tired of serial dating after his divorce in 2005. None of the women referred to him by well-meaning friends and family were the right fit, he says. Eventually, "a waste of time, money and heartache," as he put it, drove him to Kelleher International, a San Franciscobased firm that counts NBA All-Stars, celebrities, Hollywood directors and billionaire investment managers among its clients. These rich and often well-known people want to steer clear of gold diggers, says Kelleher co-owner Amber Kelleher-Andrews. "They're too busy to find love," she says of the firm's clients. "Matchmakers can cut right to the chase." To be personally matched by founder Jill Kelleher, members need to fork over serious money. "A client called us last week and insisted on Jill matching him. He said $100,000 to meet the right woman was nothing compared to the $4 million his divorce was costing him from the wrong woman," says Kelleher-Andrews. Matchmaking agencies advertise different strengths to attract high-end clients. Barbie Adler, CEO of Selective Search, worked in executive recruitment before she started her agency in Chicago 10 years ago. "My experience has been crucial to looking beyond a résumé to make a good match," she says. Indeed, clients are willing to part with a minimum of $15,000 for Adler to work with them. Other firms take a scientific approach. The British firm Seventy Thirty, which charges its clients a minimum of $15,000, has a team made up exclusively of psychologists. "Psychologists know how to interview and read people," says head matchmaker Trudy Hill, whose firm is named for the 70:30 work-life ratio that successful people supposedly need to be happy (clients provide the 70, the agency provides the 30 in the form of a mate). "It helps to know which client can benefit from positive coaching and recognize different personality types to find a successful match for." As with any industry, high-end matchmaking has its share of unsatisfied customers. "There is a tremendous pressure on the relationship to live up to its fee," says Barbara Feld, psychotherapist at Park Avenue Relationship Consultants in Manhattan. Last year the Council of Better Business Bureaus (BBB) received 2,519 complaints from disgruntled customers of matchmaking businesses, up 4% from the previous year, helping put dating services  both online and offline  among the top 100 industries that consumers complain about. "Complaints to BBB about high-priced matchmakers are often very impassioned," says Alison Southwick, a spokesperson for BBB. "Imagine shelling out thousands of dollars and in return getting set up on a date with a married man." Another point of contention among clients of high-end matchmakers? Ironically, how much money their dates make. "A man isn't necessarily looking for a woman who makes as much money as him," says Nightingale of Premier Match. Sometimes men are intimidated by high-earning women. Women know this and often set out to avoid falling for a mate with a financial chip on his shoulder. This helps explain why female clients often request to be matched with men making the same amount of money as them, says Hill of Seventy Thirty. Each agency also has a database of men and women who join for free. When a client who has paid thousands of dollars gets matched with a non-fee-paying member, the latter may feel obligated to put his or her emotional expectations on the side. Ultimately, the person who paid money for the relationship is in control, according to Feld. "Money is the hardest thing for couples to talk about," she says. Who said love don't cost a thing?